Cheese is awesome, isn’t it? 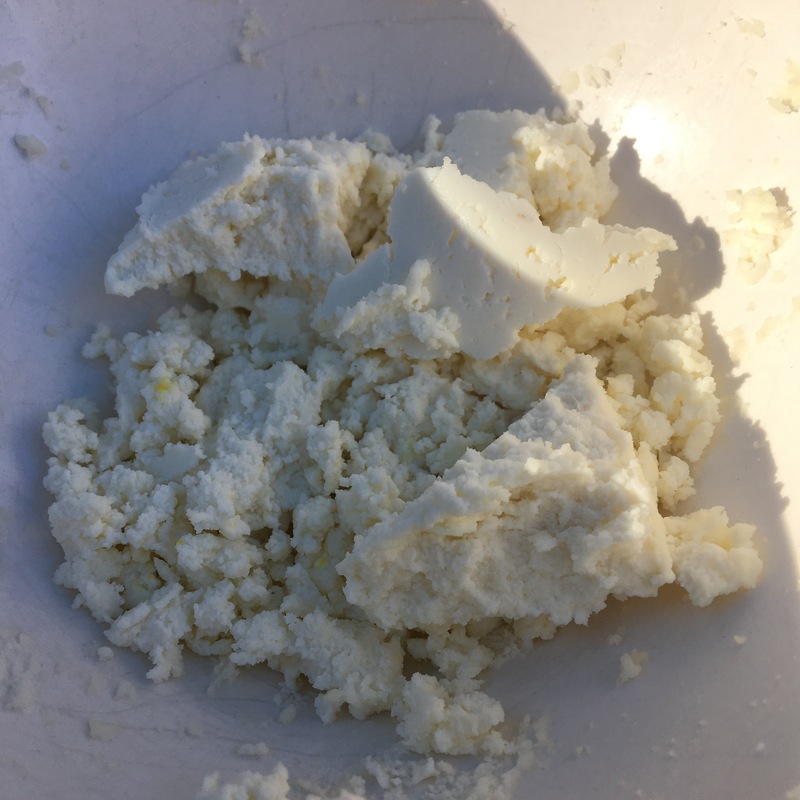 As part of my ongoing home dairying adventures, I’ve settled on a simple method for making fresh cheese that I think is historical and that produces a very tasty final product. I made some today and remembered to snap a photo before we gobbled up every molecule. Cover and let stand at room temperature overnight (up to 24 hours), until milk is fully soured (cultured). Transfer cultured milk (called “clabber”) to the pot. Heat, stirring occasionally, until the clabber curdles. This happens faster than you might expect. Line the colander with a kitchen towel or several layers of cheesecloth. If you want to reserve the whey, place the colander over something big enough to catch that much liquid. Drain the curds by pouring the curdled clabber slowly through the lined colander. Draw up the corners of the cheesecloth, tie loosely, and hang to drip drain. I use a wooden spoon to suspend the bundle over a pot or deep bowl. If you are impatient, you can squeeze the curds, but this makes the texture less creamy. When the curd reaches desired dryness, add salt to taste, or use in any recipe calling for fresh cheese. In addition to being a perfect base ingredient for many recipes, this cheese is great spread on fresh bread. If you go that route, do experiment with adding other flavors to it.